Visuals play an important role art of social media. Today, all of the top social media support visual content, and some are even completely dependant on it. Facebook, Twitter, Instagram, Pinterest, and YouTube are examples of platforms that support visual content. At the same time, Instagram, Pinterest, and YouTube are examples of brands that are dependent on it. Have you ever tried making an Instagram post without including a photo or video? The same goes for Pinterest and YouTube. Needless to say, visual content fills up a huge share of the content we consume on social media, and in order to stand out using it, you need to have a strong strategy in place that allows you to cut through the noise. A 2011 study by AOL/Nielsen showed that 27 million pieces of content were shared every day, and today 3.2 billion images are shared each day and this just goes to show both how effective visual content is, but also how tough the social media landscape is. I think it’s safe to say that unless you’re using visual content on social media, or not putting too much effort into the visuals you’re missing out on great opportunities. 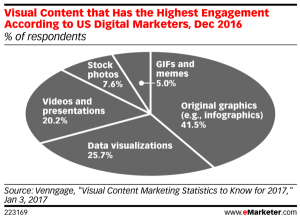 And the importance of visual content doesn’t exactly come as a surprise when you look at the statistics of visual content and how us humans resonate with it. 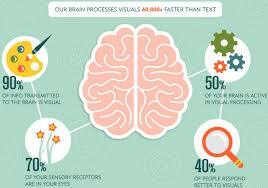 A study by Chute and Digiday found that visual content, on average, performs 4.4 better than text on social media. A study by Buffer found that tweets with images perform significantly better than those without. 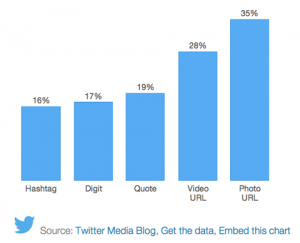 In fact, tweets with visuals receive 18% more clicks, 89% more favorites, and 150% more retweets. Photos are the most engaging type of content on Facebook, with a whopping 87% interaction rate from fans. Moreover, photos can boost the number of retweets by 35%! I can go on and on about the importance of visual content on social media, but I think you get the point now. The big question is how you can implement them into your social media content strategy and generate great results from them. And luckily, that’s exactly what I’ll cover in today’s article. 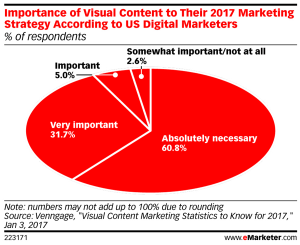 Although visual content is extremely important on social media, a lot of marketers are still struggling with it. And this is the main reason that I decided to write this article in the first place. The more positive note is that marketers realize that visual content is important. 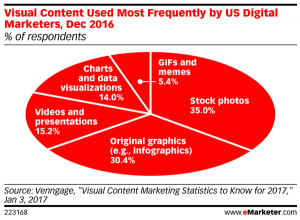 In fact, according to a study by emarketer, the vast majority said that visual content is important for their social media marketing strategy. 60.8% said that it was absolutely necessary while 37.7% and 5% said that it was very important or important. But what type of content generates the best results and the highest engagement? What is concerning though, is that the respondents’ usage habits don’t reflect the data above. It’s simply not enough to just produce visual content for social media. You need to provide visual content that your audience is asking for, and that you know will resonate well with them. That’s why I think it’s time to start looking at how you can do just that. As a brand, it is crucial that you have brand message and personality. Hopefully, you’ve already done all of those things. But what many people don’t think about is that the visual content you share should also follow your brand message and your brand’s style. However, doing just that can be a bit of a challenge. Your brand message and style should reflect the way you want to be portrayed as a brand. In other words, how you want your audience to see you and what they think about when they think about your brand. What feelings do you want to mediate? You now know how powerful visual content is, and therefore, you’ll understand how effective visual content is with mediating those things. The only challenge is to actually get your visuals to mediate something, and get the viewer to feel some kind of way. One of my best examples is Amiri clothing. It’s very clear that they have planned their visual content strategy very thoroughly on how they’re going to shoot and post their images to mediate a feeling. So how can you develop your own visual style? 1. Do you have an established color palette? All brands who successfully share visual content have decided on a color palette or theme that they follow. Normally, the colors that are mostly used are colors that are known to “belong” to the brand. In other words, the brand’s colors. The reason to why you should think about colors when creating visuals is that it helps create a more coherent brand message. 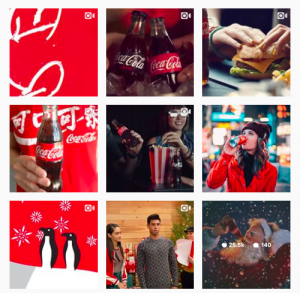 When you think about Coca-Cola, you think about the color red, for example, and that’s because they’ve emphasized color in their marketing. And this stretches far outside of their visual content on social media, even if the color red can be seen in almost every social media post they share. It’s quite clear what color they want to associate their brand with, right? When deciding on a color palette, just ask yourself: what color(s) do I want my audience to associate with my brand? 2. Is there a brand or style that inspires you? 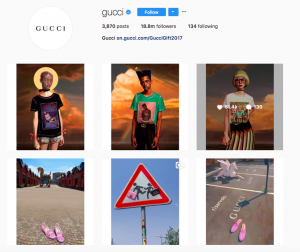 Take a look at brands and accounts that inspire you and try to replicate some of their posts in terms of style, composition etc. 3. Are you going to have a consistent visual style? The answer to this question should be yes, however, there are a few exceptions. A part of this is the colors you choose, but there are much more to it than only colors. The reason you want to have a consistent visual style is so that your content can be instantly recognizable, and people can instantly think of your brand when they see it. Moreover, it also helps make your content more relevant, because you present your audience with something that they enjoy with your brand and something that aligns with the feeling you are trying to mediate. People don’t want to see a post of a tree with saturated colors one minute, conveying a feeling of happiness and joy, and then a black and white image the next minute. It just doesn’t go together very well, right? It will make your audience confused about what your brand really stands for. Unless it aligns with your brand message and how you want people to see you, of course. There are hundreds of ways you can present your visual content, and again, this depends on how you want to be seen. 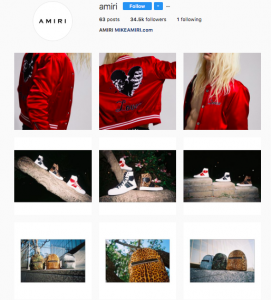 Some brands follow the format of sharing collages while others stick to solely square images. Following a particular theme in the format your visuals have will also help empower your brand’s message. Websites like Canva will allow you to choose between hundreds of different frames for your images if this is something you want to have. All social media platforms are different, and this means that the optimal sizes for your visual content are equally so. When creating visual content, you don’t only want to share it on one social platform, and therefore, you need to have the image sizes in mind when you’re sharing them across platforms. Something that you also need to know is that different types of visual content work differently for different platforms. As a result, you might need to either optimize or create different content for different platforms – even if it entitles more job. The good news is that many times, content that is shared on one platform might only need a little polish before going out on another platform. Charts is the ultimate type of visual content when presenting data and statistics. If you’re a brand that is working with just that – even better! If you are going to present statistics, you don’t want to present a boring image of some numbers. Instead, you want to make it fun and engaging. Possible even include your brand’s colors as I mentioned earlier. 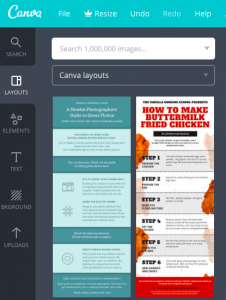 Again, if you want to create your own charts, Canva is a great free tool you can use, but there are also tons of other free options like Chartgo and Infogram. Infographics is a big deal on social media because everyone loves them! They’re a fun and engaging way to present information and/or statistics on, and they’ve increased dramatically in popularity over the years. In fact, Infographics were the B2B content marketing tactic with the biggest increase in use, from 2015 to 2016, up from 50% to 58%. And it’s not very surprising considering the fact that an infographic is 30 times more likely to be read than a purely textual article and that infographics are liked and shared on social media 3x more than other any other type of content. Infographics allow you to present data and information in a more appealing and digestible way, thus making your content more appealing to your audience. In turn, this will result in a higher engagement. Again, Canva is a great free tool that has hundreds of templates that you can use to make your own infographics. Let’s not forget about videos! When talking about visual content, many tend to get stuck in the mindset that they only have photos at their disposal. This is certainly not true. In fact, video is, many times more effective than video. Do you remember the statistics I presented about images and how powerful they were? How powerful do you think a video that is recorded in 60 frames per second? Now, obviously, it won’t be 60 times more powerful, but still, it will be very powerful. Did you know that companies which use videos in their marketing grow revenue 49% faster year-on-year than those which don’t? Did you also know that companies which use videos in their marketing enjoy 27% higher CTR and 34% higher web conversion rates than those which don’t? There are endless opportunities with video, and only your imagination sets the limits. 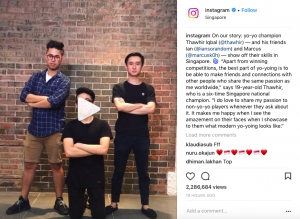 You can create long YouTube guides where you tell your audience how to do something, or you can create 3-second videos for Instagram or Facebook that is fun and engaging. There are really not a lot of limitations here. Just follow your brand message and visual theme and create videos that you know your audience will love and then start posting! I think it’s safe to say that visual content has an incredible marketing power. And this does not only concern social media. In order to succeed on social media, you need to produce content that stands out from the crowd, and after having looked at the incredible statistics of visual content, I think you know what type of content you should focus on, on social media for success. An endless number of posts and visuals is being shared on social media every day, so posting average content won’t cut it. it will quickly disappear in the noise. In order to cut through the noise, you need to have a strong strategy and plan to how you’re going to dominate social media and win your audience’s attention with visual content.